BC Civil Litigation: Article - How do I know if my case is worth going to court in British Columbia? is Worth Going to Court? You may feel that you have been wronged, but that might not be a legal claim. for example, a nasty neighbour who swears in front of your children may be infuriating, but you wouldn't likely have a legal claim. Or you may feel cheated by a company, but in the contract, you may have given up your rights to sue them. A good lawyer can review your options and evidence with you. You may have a legal claim, but you might not be able to prove it. If there is no evidence to back up your case, or you can't find witnesses who will support your case, it may not be worthwhile pursuing. Your lawyer can help you access your evidence. Simple economics. A $50 dispute may not be worth suing for, even if you have a good chance of success. However, if you have an ICBC case involving $150,000 in potential damages, it may be worthwhile pursuing, even if your chance of success doesn't look that good to you. Your lawyer can help you review this. Suing can be very expensive. However, in some cases, lawyers will take a case on a contingency basis, which means that you don't pay any fees unless you win, and that your fees are based on a percentage of the amount recovered, rather than by the hour. 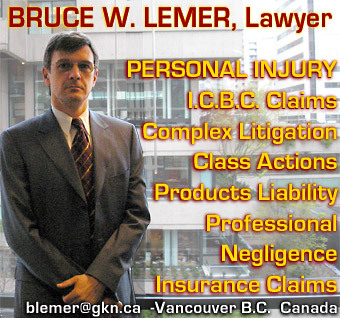 © copyright 1999 Lawyers-BC.Com Services Ltd.